Altrincham goalkeeper Andrew Dawber collides with Morpeth's Michael Chilton in a controversial moment of the game. Picture by Chris Chambers (CJC Photo). Morpeth Town exited the FA Cup valiantly after a 3-0 defeat to National League North side Altrincham at the J Davidson Stadium on Saturday. Damian Reeves headed the hosts ahead four minutes before half-time, and after the break Sean Taylor was denied superbly by Andrew Dawber. Sean Miller doubled the advantage on 76 minutes, but Morpeth should have had a penalty when Michael Chilton was heavily brought down in the area. The Robins took full advantage of having an extra man and Simon Richman added a third for the hosts deep into injury time. 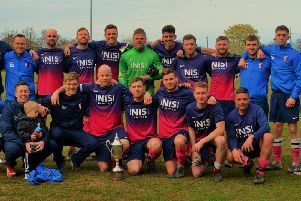 Morpeth’s FA Cup run has came to an end for another season, but they can take great pride in what they have achieved as the last time the Highwaymen reached the Third Qualifying Round of the competition was 17 years ago. They got out of the blocks quickly, as did the hosts, and there were chances for both sides with Sam Patterson going close for the hosts, before Paul Robinson fired into the side netting for the Northumbrians. Liam Henderson struck a fierce shot into the arms of Andrew Dawber and then the hosts came to life and started to turn the screw. Greg Wilkinson went close with a volley on the edge of the area, before Karl Dryden wascalled into action soon after. The ‘keeper had Miller’s driving effort covered before Reeves, who was making his 300th appearance for the Robins, headed inches wide. It was Altrincham who were on top at this point and the chance, arguably, should have been put away, but the hosts did take the lead four minutes before the break. Jake Moult crossed brilliantly for Reeves, who, falling backwards, headed back across goal and the ball hit the post and nestled into the net. Morpeth started the better after the break, Robinson flicked Ben Sayer’s free-kick at goal before substitute Steven Anderson had a glorious effort to level the game. Sean Taylor curled in a brilliant cross, Dawber approached, but missed and Anderson headed down and inches wide. Charlie Joyce drove his shot the wrong side of the post, but the visitors were searching for the goal that would level the game. After some fine football around the edge of the Altincham penalty area, Taylor struck at goal, but Dawber pushed the ball over the bar. However, after going close through Miller, the Robins found their second goal of the afternoon. Phil Marsh had only been on the pitch a matter of seconds before crossing for Miller, who tapped in from close range. Chilton suffered a serious blow on 82 minutes, and Morpeth should have been awarded a penalty, but nothing was awarded and they had to play the rest of the game with 10 men. The forward didn’t move for five minutes before being stretchered off, and the Robins made the extra man count as they found a third deep into additional time. Dryden did well to push Marsh’s effort onto the post, but substitute Richman followed in and rifled the ball into the roof of the net.